where h is the unknown free surface height relative to the mean level H.
This model is available as an automated tutorial by selecting Model Examples and Tutorials... > Classic PDE > Shallow Water Equations from the File menu. Or alternatively, follow the step-by-step instructions below. Both the Custom Equation and Convection and Diffusion physics modes are used in this example. Enter h into the Dependent Variable Names edit field. Select Rectangle from the Geometry menu. Enter 5 into the xmax edit field. Define the equation for the height with a small disturbance as initial condition. Enter h' + (u*hx_t + v*hy_t) + (h+H)*(ux_t+vy_t) = 0 into the Equation for h edit field. Enter 0.2*exp(-((x-4)^2)) into the Initial condition for h edit field. Add two Convection and Diffusion physics modes for the two velocity components. Although the Custom Equation physics mode could also be used, the Convection and Diffusion physics modes feature pre-defined equations and convective stabilization which is necessary for these equations. Select the Convection and Diffusion physics mode from the Select Physics drop-down menu. Enter u into the Dependent Variable Names edit field. Enter 0 into the Diffusion coefficient edit field. Enter u into the Convection velocity in x-direction edit field. Enter v into the Convection velocity in y-direction edit field. Enter -g*hx into the Reaction rate edit field. Press the Artificial Stabilization button. Select the Check to enable shock capturing check box. Select High order from the Shock capturing discretization order drop-down menu. Enter v into the Dependent Variable Names edit field. Enter -g*hy into the Reaction rate edit field. Define the two constants for the mean fluid level H = 1, and the gravitational constant g = 9.8. Select the Neumann, g_h radio button. Switch to the cd tab. A wall with zero velocities is prescribed at the right end, and the top and bottom boundaries are assumed to be symmetric (zero normal flow). Select Concentration from the Convection and Diffusion drop-down menu. Switch to the cd2 tab. Select 1, 3, and 4 in the Boundaries list box. Select Concentration from the Convection and Diffusion 2 drop-down menu. Select the Time-Dependent solver with the following parameters. Enter 1e-3 into the Non-linear stopping criteria for solution differences (changes) between iterations edit field. Enter 0.01 into the Time step size edit field. Enter 1.5 into the Duration of time-dependent simulation (maximum time) edit field. Once the solver is done, turn on the height plot for h and visualize the free surface for different times. 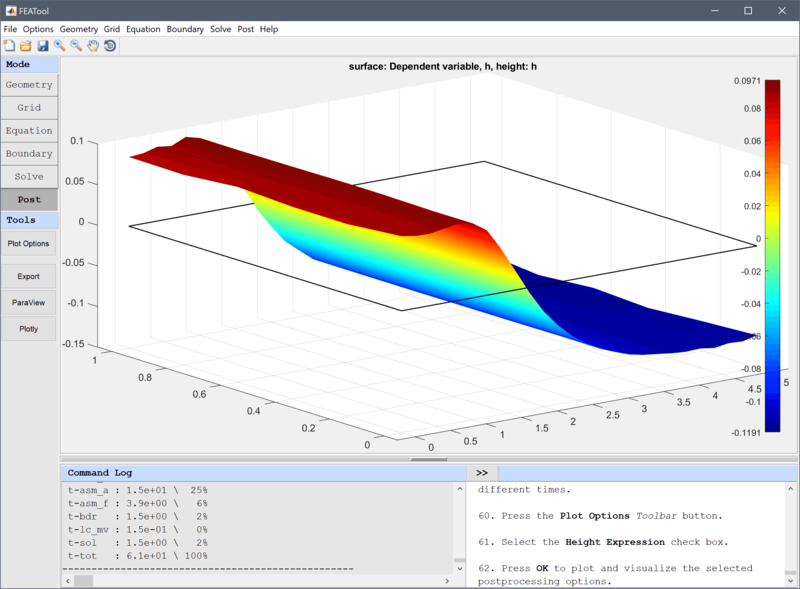 The shallow water equations fluid dynamics model has now been completed and can be saved as a binary (.fea) model file, or exported as a programmable MATLAB m-script text file, or GUI script (.fes) file.